We’d love your help. 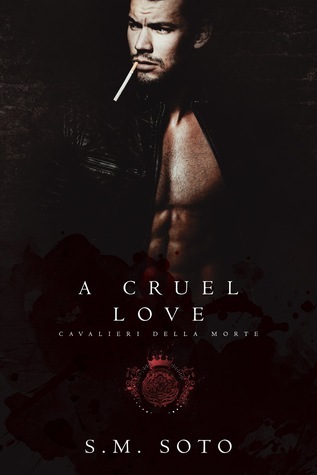 Let us know what’s wrong with this preview of A Cruel Love by S.M. Soto. From the moment he saw Blossom Jaymes through the window of her bakery, he knew he was in too deep. Not only was she as sweet as her perfectly crafted treats, but she was a soft-spoken, golden-haired angel that shone like a bright beacon in his dark world. And Percivale didn’t deal in angels. He dealt in death and As a hitman for hire, Percivale is no stranger to violence. To ask other readers questions about A Cruel Love, please sign up. This one had me all kinds of hot and bothered. He's a bad man. There's no two ways about it. She's a good girl. The kind of character I get all Mama Bear over. Together they are explosive and surprising. Get it on your TBR. Trust me. S.M. Soto was born and raised in Northern California where she currently resides with her son. Her love for reading began when she was a young girl, and has only continued to grow into adulthood. S.M. lives for reading books in the romance genre and writing novels with relatable characters. She refers to herself as a bit of a romance junkie. S.M. loves to connect with readers and eat copious of do S.M. Soto was born and raised in Northern California where she currently resides with her son. Her love for reading began when she was a young girl, and has only continued to grow into adulthood. S.M. lives for reading books in the romance genre and writing novels with relatable characters. She refers to herself as a bit of a romance junkie. S.M. loves to connect with readers and eat copious of donuts that will surely lead to her demise (carbs are life).